The secrets I share today will show you how to put together a wine tasting that will make you look like a professional chef. I returned home from an amazing trip to Kenya and have a ton of pictures to sort though. Our friends and family have been asking to see them, but I don’t just want to swipe through them on my phone. Instead, I’m hosting a small viewing party. For the menu I’m serving Tapas and wine. 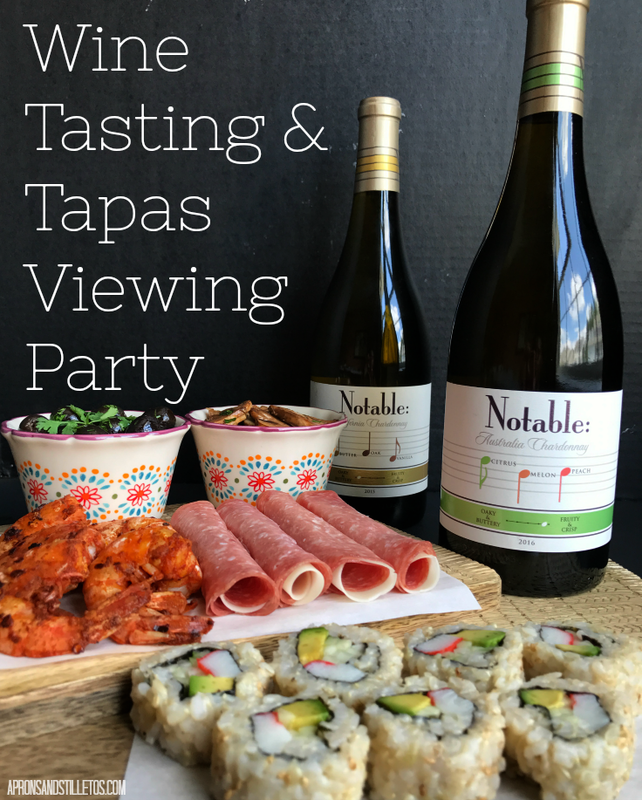 The Tapas I’m serving are a mix of cold and hot snacks chosen to pair perfectly with these Notable wines. 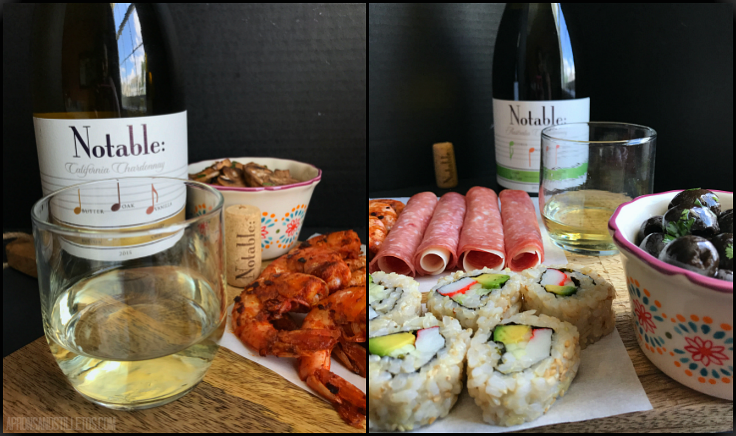 I bought the both the Notable’s Oaky & Buttery Chardonnay and Notable’s Fruity & Crisp Chardonnay from Kroger to pair with my Tapas. The menu is a mix of store bought snacks and home made. The Notable wines launched in March 2017 and have two flavor profiles. 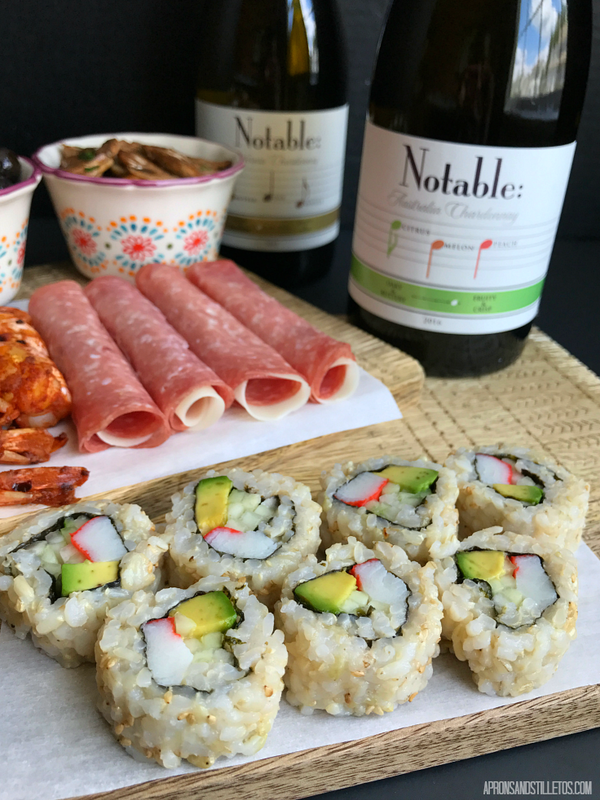 The Notable’s Oaky & Buttery Chardonnay has hints of butter, oak and vanilla. 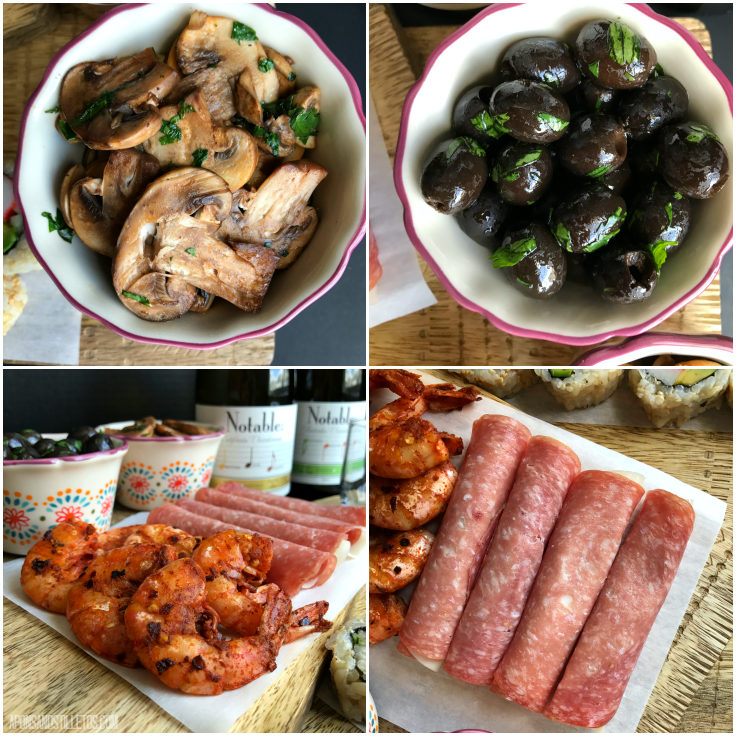 Those flavors are smooth and light so I paired them with four savory and flavorful Tapas. My guest will be able to enjoy this flavor profile with spicy shrimp, Wasabi Seaweed Chips, Garlic Herb Mushrooms and marinated olives. The Notable’s Fruity & Crisp Chardonnay is refreshingly crisp with hints of citrus, melon and peach. That flavor profile is like a party in the mouth so I wanted some fun Tapas to pair with it. I decided on sweet California Rolls, Salami and Provolone rolls with baguette. For the viewing party, I’m serving a mix of homemade and store bought Tapas. The store bought options are the California rolls, Wasabi Seaweed Chips, baguette and Salami rolls. The shrimp, olives and mushrooms I made using really simple recipes. Heat oil in a fry pan. Rinse shrimp (don’t peel). Season shrimp with paprika, salt, pepper and red pepper flakes. Cook shrimp in hot oil for 3-5 minutes per side. Drain the olives. Mix all of the ingredients in a bowl. Cover and marinate in the refrigerator for 1 to 24 hours. Serve at room temperature. Heat oil in a fry pan. Add the garlic and simmer for about 1 minute. Ad the mushroom and season with salt and pepper. Sauté mushrooms and garlic in hot oil for 3-5 minutes then add the cilantro. Stir for another minute and serve. With my Africa viewing party menu complete, I can start setting up my deck and family room. Have you been follwing the preparation process on my Instastories? If not, tap the link to follow @apronsandstilletos now and you’ll see the videos when they are loaded. 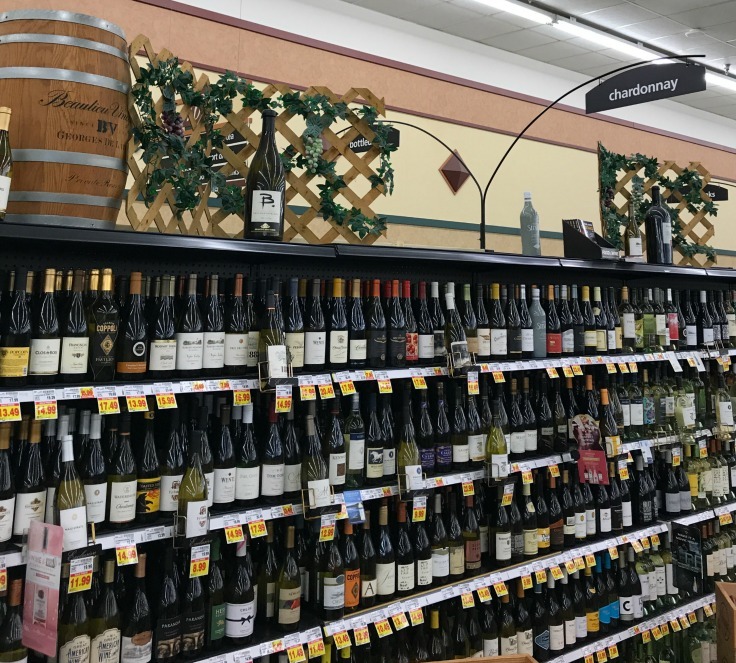 Tap the following link learn more about where to find these Notable wines and what foods pair well with them.